Home > News > Early Years > Make Mr Martin laugh! 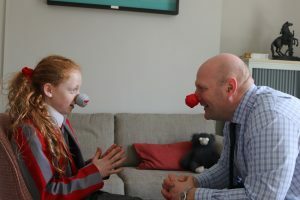 On Friday 15th March, children were invited to do something funny for money for Comic Relief: Red Nose Day. Children from Reception to Year 6 brought their funniest jokes and silliest faces to the Headteacher’s office. Mr Martin had over 50 jokes told to him over the course of the day! William in Form 1, Gracie in Form 4 and Sapphire in Form 5 received the biggest laughs. Great work! The children raised £85.00, with a further £27.00 raised by our Stay and Play visitors. That’s £112.00 which will go towards helping people in the UK and around the world. Thank you! We have put together a video for you to enjoy of just some of the jokes. Raising money while having fun!